Texas used two goals in each of the first two periods to roll to a 5-2 victory over the visiting Peoria Rivermen tonight in Cedar Park. "We had a good first and second," said Coach Desjardins, referring to the Stars' 4-0 lead after forty minutes. "We needed that lead in the third. They capitalized on some of our miscues." The Stars allowed two goals in the third but got an empty net goal from Matt Fraser to seal things in the final minutes of the game. 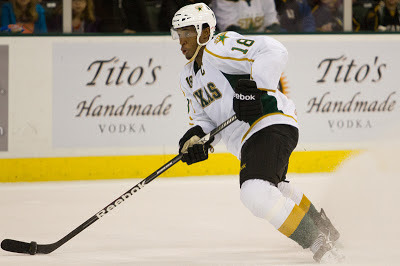 In all, Texas got goals from Jamie Oleksiak, Colton Sceviour, Max Fortunus and Matt Fraser (2). It was a spirited game, carrying a physical edge as well. "Peoria's always got a physical game," said Colton Sceviour, who had a shorthadned goal and power play assist in the game. "Last game there were three fights in the first five minutes. It might have spilled over a bit." The Stars got off to a great start in the first period as a blast from the right point by Jamie Oleksiak found twine through traffic at 4:40. The 1-0 goal was assisted by Antoine Roussel and Jordie Benn. Late in the period, Texas had two skaters in the box and faced 31 seconds of 3-on-5 time. After killing the first penalty, Colton Sceviour skated the puck out of the zone and toward Jake Allen's net shorthanded. "I saw that Reilly Smith was on my side. He's not much of a goal scorer, doesn't have a lot of finish," Sceviour joked. "So I figured I'd take things into my own hands." Sceviour's shot went far side on Allen and set the score at 2-0. It was Texas's fifth shorthanded goal of the season. The Stars would continue in the second as Max Fortunus snuck down from the point as a Peoria penalty expired and potted a rebound for his second of the year. Matt Fraser went next on a great passing play from Sceviour. "I don't know if that was intentional or lucky," said Sceviour. "But it worked out well." Sceviour sent the puck cross-crease on a between-his-own-legs pass to Fraser, who buried the puck top shelf over Allen on the backdoor. Texas would end the second up 4-0. The Stars ceded two goals to start the first, however. "We didn't come out with the same intensity in the third as the first. We let them back in a bit." Goals from Adam Cracknell and Brent Regner (shorthanded) cut Texas's lead in half in the first nine minutes. Both came on defensive breakdowns by Texas. The Stars buckled down, with Jack Campbell stopping fourteen of sixteen in the frame to achieve the win. Texas would finish it off with an empty net goal from Fraser at the 18:50 mark. The goal was Fraser's team-leading 14th of the year. The Stars will finish their three-in-three weekend tomorrow with a home game against Houston. Texas moves to 18-11-3-2 and 41 points on the season with tonight's win. Travis Morin missed the second and third periods after a check to the head. Coach on Morin: "The doctor will evaluate him. I don't think it's bad. We thought he might come back [in the game]." Matt Fraser on his linemate, Morin: "That's probably the most time I've played without him in the middle going back to last year. It was a little bit of an adjustment." Wathier has missed four games now. Coach was very non-specific on Wathier: "He's just been banged up. I don't know when he'll be back." Good quote from Sceviour on Antoine Roussel, who generated a four minute power play late: "The game that Antoine Roussel plays is an amazing one, and it's not one that a lot of players want to play. He gets under the skin and does a heck of a job at it. You create space for the guys on the power play to have a chance to get the puck in the net."